There are many causes for “sediment” in water. 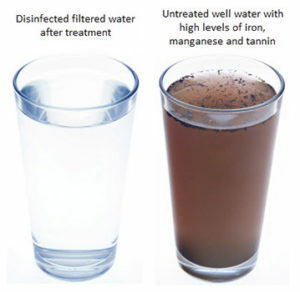 Although sediment (those particles which can settle out in a jar of water) is often described as looking like dirt, soil or sand, sometimes it is caused by dissolved metals, such as iron, that precipitate out of solution. 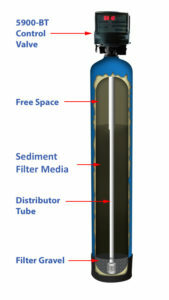 It is important to properly identify the cause in order to choose the right filter or system. In private well water, often what appears to be sand, is actually particulate material from various sources. Iron or manganese oxides (rust). Actual particles from groundwater such as silt or sand from improperly run or constructed treatment plants or non-treated well water. Sand, grit or particles from improperly flushed pipelines after repairs by workmen. Decaying storage tank liners, pressure tanks, or pumping system. Black ferric sulfide after hydrogen sulfide odors. Particles, sand, grit or sediment from malfunctioning treatment plants.